1) Voice Acting - Thumbs Up - Bridgette Mendler is perfect as the brave and inquisitive Arrietty. David Henrie also does a great job, Shawn's despondency at his possible fate yet his need to connect coming through quite nicely. Carol Burnett is a hoot as the maid Hara. Amy Poehler was a lot of fun as Arrietty's overprotective mom. Nice job by all involved. 2) Artwork/Animation - Thumbs Up - There's a reason why Disney likes to import Studio Ghibli's works. Not only are the stories great and appealing, but their unique art style with the gorgeous backdrops are a feast for the eyes. Major kudos to the creativity by Miyazaki's people in creating a believable world of little people. The physics of normal liquid drops for those of that size was well done and helped give their lives a unique flavor, which pulled you that much further into the secluded family's miniature world. An amazing amount of well thought out details. And just enough diversity in the glimpses of the city and the location of Aunt Jessica's house that this could be just about anywhere if you don't look too deeply. Maybe even your own home. 3) Plot/Story - Thumbs Up - A simple seeming story with very deep subtext. A number of points are touched upon, yet the adult viewers are left to realize some of the harsh realities behind them by the hints given, yet not spelled out to slow the pace of the fun for the kids. Loved the coverage of a lot of points of view; how the concept of little people affected not only the Borrowers but the humans who came to believe in them as well. And also seeing for ourselves the inherent dangers in discovery for all involved. If you ever cry at movies, like I do, make sure to take some tissues. You'll probably need them. I did! Conclusion: A lovely film by Ghibli Studios! 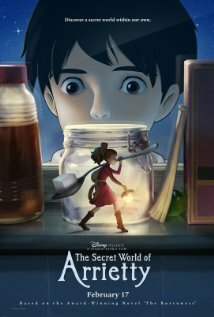 With the cat, the crow, and the bugs, should have enough action to keep the younger kids entertained as the older ones thrill at all of Arrietty's adventures. Definitely enough fodder and depth for the adults to enjoy the experience as well.